We recently heard about the lightly refreshed coupe and convertible versions of the 1-Series, but they aren&apos;t the only new BMW models coming. BMW has also announced the introduction of an M Sports Package and two new engines for the latest X3 crossover, which you may remember being shown in July. Starting in spring 2011, X3 customers will be able to order an M Sports Package to their purchase. The package adds some sporty aesthetic touches inside and out, and also seeing a revised suspension tuning. More specifically, the kit consists of an aerodynamics package with unique front and rear bumpers, side skirts, and a roof spoiler, not to mention the optional 20-inch alloy wheels. Inside, there will be sports seats with some nice touches, a Cruise Control button, and some M logos here and there. In addition to the package, BMW is also presenting two new powerplants for the European market X3. 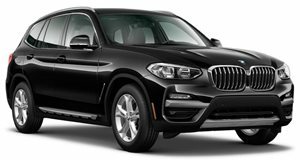 These are the 3.0-liter naturally aspirated inline-six gasoline with 258 horsepower for the X3 xDrive28i, and 3.0-liter straight-six turbo diesel with 258 hp. Both variants will go on sale in Europe next spring.